Siddharth belongs to Sagar, a small but beautiful township located in Madhya Pradesh India. He is pursuing PhD in Sitar music. Siddharth's grandfather Pdt. Shiv Kumar Shukla was an amateur Khayal singer trained in the tradition of Gwalior Gharana. Siddharth's elder sister Shambhauvi Shukla is well known Kathak dancer of Jaipur Gharana. Owning to the mixed effect of tradition and the immediate environment within the family, Siddharth's musical education started very early at about the age of four. In 1998 Siddharth Shankar was influenced by Sitar Maestro Pdt. Sanjay Guha of Maihar Gharana, a senior disciple of famous sitarist late Pt. Deepak Choudhary. Sanjay ji still continues his taleem from Bharat Ratna Pt. Ravi Shankar. 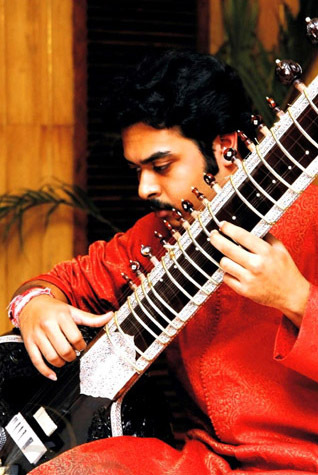 Siddharth Shankar has incessantly pursued the path of Sitar music under the tutelage of his guru Pdt. Sanjay Guha. Subsequently being an exceptionally fast learner Siddharth's first Sitar stage - performance came at the early age of 12. Since then he has gradually presented his taleem, taiyaree and talent in the mode of Maihar Gharana and has earned many a loreyals to credit himself. Apart from being a sitarist Siddharth is also apt in tabla playing which he has learned from Shri Mohandas Shringrishi. Siddharth's control over laya can only be matched with his sensitivity to swara. This unique blend of important qualities reflect a great promise in Siddharth, under the guidance of Sitar maestro Pdt. Sanjay Guha who is hailed for his ability to produce performing artists of young age.